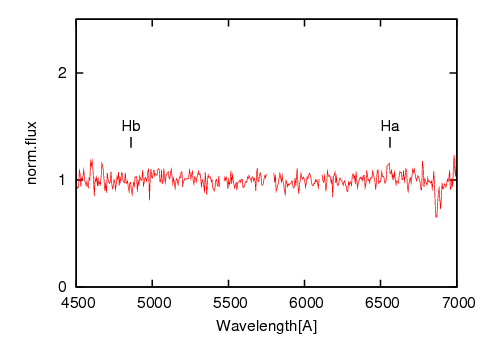 We started spectroscopic observations of MM Hya in the current outburst. 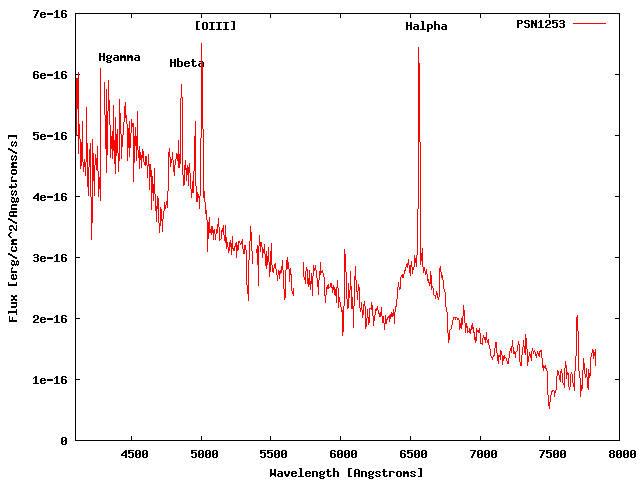 The figure shows our spectrum of MM Hya on Apr 10. 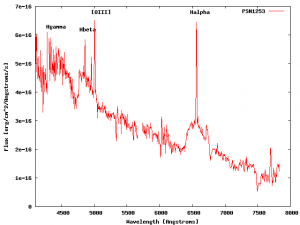 We detected H-alpha and H-beta features. 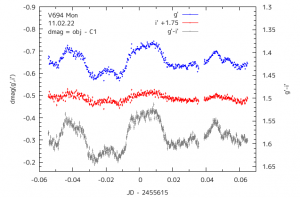 This suggest that light from an optically thick disk is dominated in the optical wavelength. This light curve was observed on 2011 Feb 22. 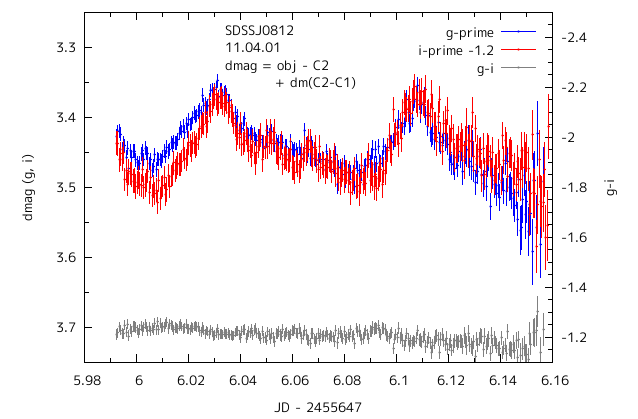 The amplitude of this rapid variability (~ 0.15mag in g' and ~ 0.04mag in i') is slightly smaller than that on 2010 Dec 05 (0.2mag, 0.05mag), whereas the time scale of it (~ 30-40min) is shorter than that (~70min). 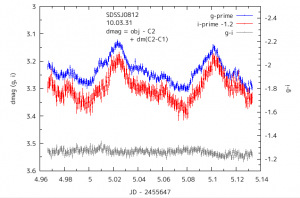 We observed this symbiotic star on 2010 Dec 05. 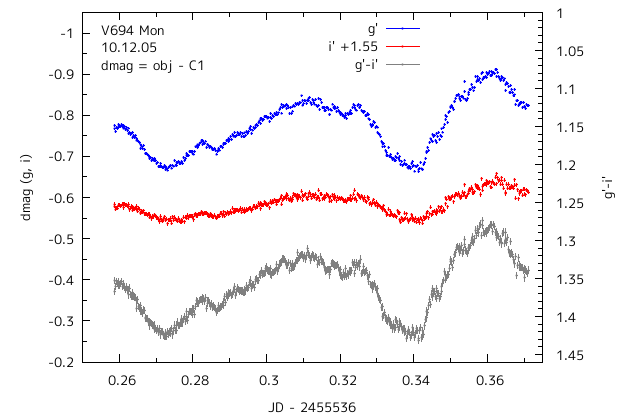 In this LC, rapid variability (= flickering) is cleary seen (maximum amplitude ~ 0.2mag in g', 0.05mag in i', and a time scale of variability ~ 70min). 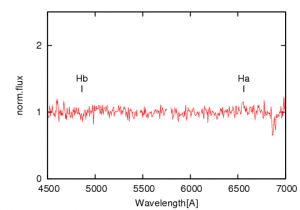 Since this object shows this flickering feature and P-Cygni profile in emission lines, the object is considered to be a face-on jet system. We update LC observed on 2011 Apr 07, using same comparison procedure with that for 2011 Apr 06. 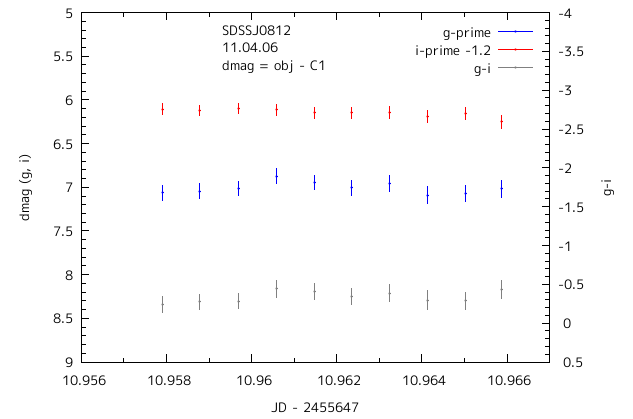 We update LC observed on 2011 Apr 06, using C5 but dmag(=m_obj - m_comp) was converted to that using C1. We performed optical spectroscopic observations of type-IIP supernova, SN 2011az (c.f. CBET 2680), on Mar. 28. 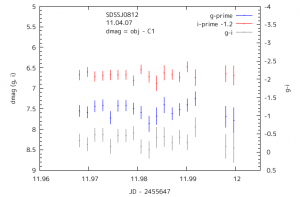 Broad Balmer emissions of SN and narrow ones of the host galaxy are detected. 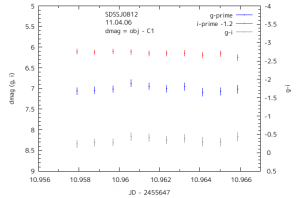 Absorption components of balmer lines were weak. 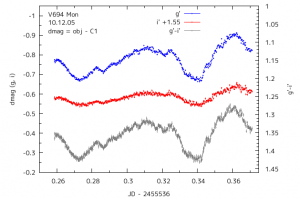 These features suggest that the SN 2011az is in the early phase of its explosion. 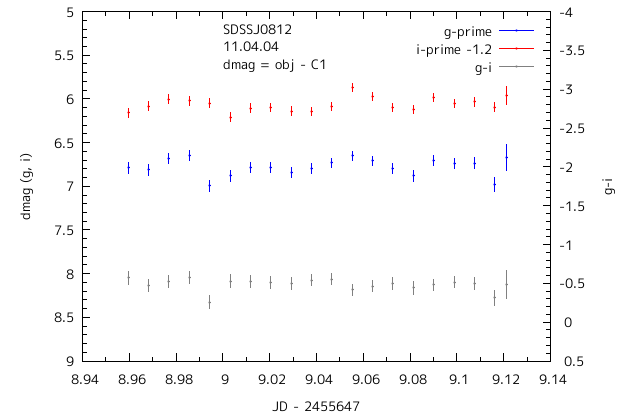 We update LC observed on 2011 Apr 04, using C1 and averaging 10 frames. The object was in rapid-fading phase. 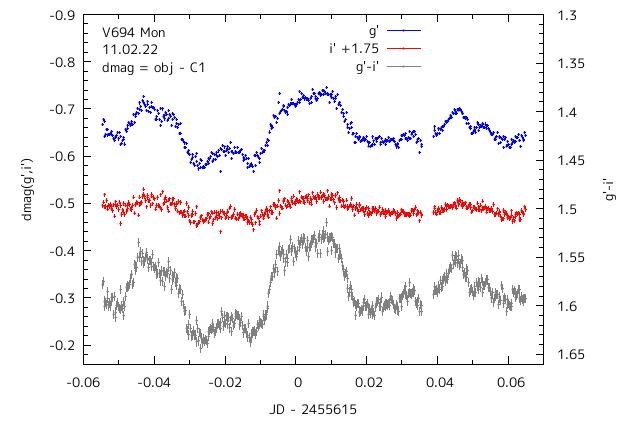 We update LC observed on 2011 Apr 03, using C1 for comparison star. The object was seemed to be in rapid-fading phase. We update LC observed on 2011 Apr 01. 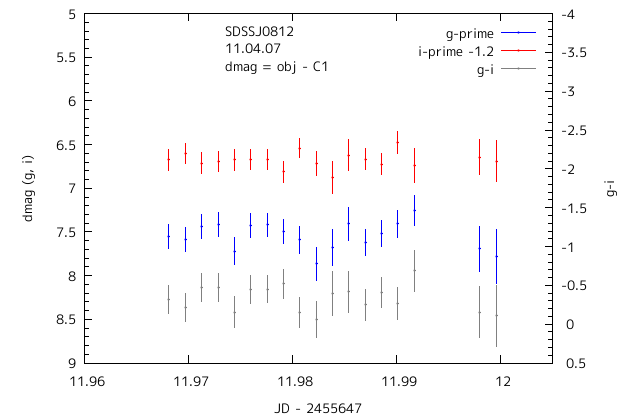 As for 2011 Mar 29, 30 and 31, C2 is used for comparison star, but dmag is converted to that using C1. 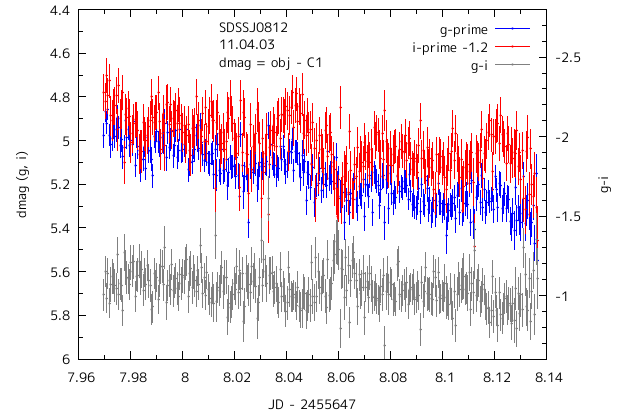 We update LC observed on 2011 Mar 31. 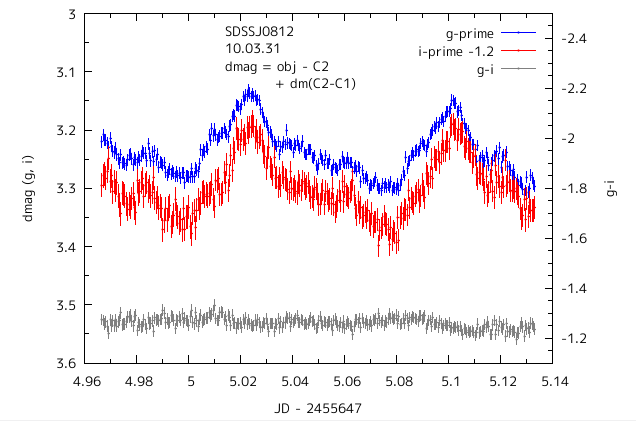 As for 2011 Mar 29 and 30, C2 is used for comparison star, but dmag is converted to that using C1.